Alas, this post isÂ not about any bachelorette-style shenanigans. No, today I have another diy-decoration update because that seems to be what my life revolves around at this point! It’s practically unheard-of for a venue to allow brides to hang anything on the walls, but we have permission to do so for our reception space and to pass that opportunity up would be almost criminal. Granted, the “walls” are actually screens with regularly-spaced pillars, but it’s enough. I look at it like hanging your first piece of artwork or framed photo in your new apartment–it feels more like your own space and less like a rental. To take advantage of this golden opportunity, I created mesh, ribbon, and grape swags for each of the 8 pillars in the room. They’re not huge, but I’m hoping it will add a slightly more custom feel to the space just by being there. Deco mesh seems to be having quite the crafting hey-dey but frankly? After making 8 (9 counting the smaller one that I’m using on our program basket) swags out of them I am less than impressed. It’s not very resilient and frays like a–well, like something that falls apart at the least provocation–leaving a trail of plastic strands all over my living room. That said, it does fill space fairly well and is lightweight, which can certainly be important. I layered brown/coppery and gold deco meshes with some moss green ribbon and tied all of it together with plastic-coated wire. 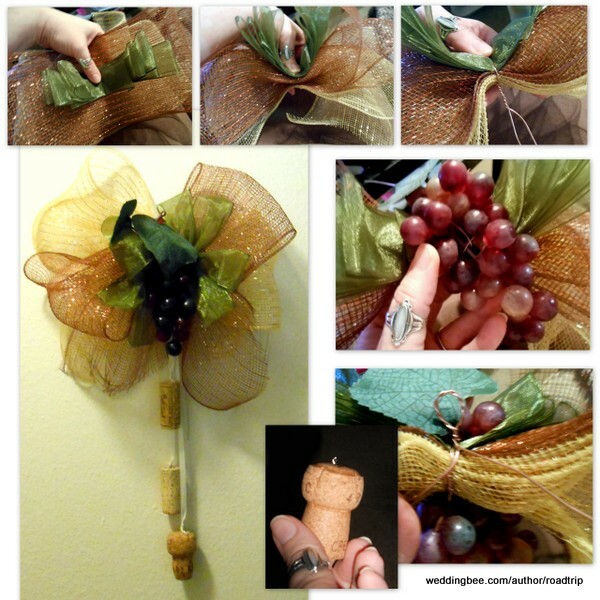 I used the tails of the wire to secure a bunch of faux grapes to the center of the bundle, twisting what was left into a hanging loop at the top of the bunch. Once everything was secured it was just a matter of man-handling the mesh into alternating loops (this being where that lack of resiliency came into play) and spreading out the ribbons. Once all of that was done, I thought it would be nice to add some length to the arrangement with 3 hanging corks. Into the top of each cork I pushed in (with the help of some pliers) some eye-pins, opening the eye enough to slip a ribbon into. I used 9″, 12″, and 15″ lengths of ribbon, tied it onto the eye and closed it up, knotting a set of 3 together for each swag. It was easiest to loop the ribbon clusters through the wire loop at the top of each swag and tie it off. I’m wondering now if it wouldn’t have been better to use slightly shorter and darker ribbons. Oh well, a done project is a done project at this point and I’m not going to let ribbon color worry me now! While I finished our dinner decorations a while back, I hasn’t done much in the way of decorations for the high-top tables we’d have for our guests to congregate around at our cocktail hour. They’ll have the standard long, white, tablecloths tied with a chocolate ribbon but I didn’t want the tops completely bare. Looks like another opportunity to use some of my bottle stash! 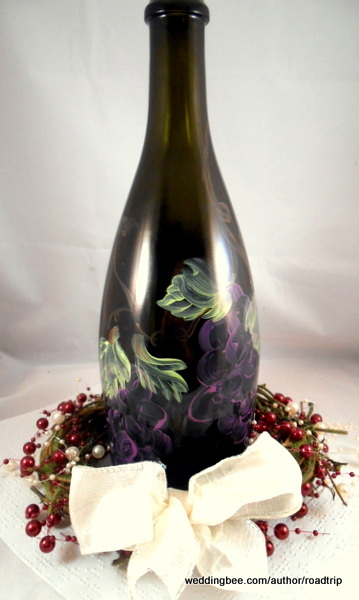 I gave each bottle a quick painting of grapes, leaves, and vines using a mixture of gloss enamel and pearlescent glass stain paints (literally mixing 2 or more similar shades of each type to get the best qualities of each). The end result was a mixture of translucent portions and visible, swirly brush strokes that are, admittedly, a bit tough to photograph but look quite nice in person. I’m happy with them at least! To go around the base of each is a small wreath. I’d purchased a roll of moss-covered grapevine garland when I ordered all those beads to put in the bottles and used 3′ lengths to make wreaths just the right size. Then I draped beaded garland over the wreaths, securing it with some pieces of moss-flocked wire, and added a bow where the ends of the garland meet–partly for pretty, partly for camouflage! This is also the point where I tone down my ire (a little) for craft stores putting out Christmas decorations when we’re not even close to Halloween, yet, since that’s where I found ivory and maroon garlands.